Manchester Dating is the first in a series of regional dating sites for the UK. 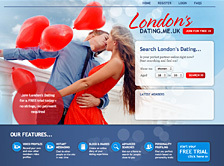 The site has been built to be fully integrated into the White Label dating platform. The brief was to design a visally eye-catching homepage that would stand out in a very competitive market and strongly appeal to a young age group. The design and layout also needed to be easily adapted for a whole series of other regional sites for the UK. Image based eye-catching homepage design that can be easily adapted for further website in the series.